Vitamin K is essential for blood clotting but must be enzymatically activated. vitamin K is primarily known as a cosubstrate in the posttranslational conversion of glutamate to γ-carboxyglutamate (Gla). There are at least 16 Gla-containing proteins in mammals, and eight of these are related to coagulation. This enzymatically activated form of vitamin K is a reduced form required for the carboxylation of glutamic acid residues in some blood-clotting proteins and the VKOR is the rate limiting enzyme in this pathway. The product of VKOR1 gene encodes the enzyme that is responsible for reducing vitamin K 2,3-epoxide to the enzymatically activated form. Vitamin K epoxide reductase (VKOR) is the target of warfarin, the most widely prescribed anticoagulant for thromboembolic disorders and its discovery led to better understanding of blood coagulation and development of anti-coagulant drugs. Though VKOR was discovered in 1974, the enzyme has yet to be purified and characterized fully for its activity kinetics. Positional cloning approach has made possible to identify and map the VKOR gene to human chromosome 16p12-q21. The SiRNA experiment suggest that MGC11276 messenger RNA codes for 163 amino acid warfarin sensitive with at least one transmembrane domain VKOR1 protein (1). Coumarin derived drugs such as warfarin presents a long-term treatment and prevention of thromboembolic events by inhibiting VKOR multiprotein complex. Despite extensive efforts this complex has not yet fully identified. The VKOR complex recycle vitamin K 2,3-epoxide to vitamin K hydroquinone, a cofactor that is essential for the post translational gamma-carboxylation of several blood coagulation factors. The VKOR complex is implicated in at least 2 heritable human conditions, combined deficiency of vitamin-K-dependent clotting factors type 2 (VKCFD2; Online Mendelian Inheritance in Man (OMIM) 607473), and resistance to coumarin-type anticoagulant drugs (warfarin resistance, WR; OMIM 122700). The vitamin K epoxide reductase complex subunit 1 (VKORC1), which encodes a small transmembrane protein of the endoplasmic reticulum. The VKORC1 contains missense mutations in both human disorders and in a warfarin-resistant rat strain. Overexpression of wild-type VKORC1, but not VKORC1 carrying the VKCFD2 mutation, leads to a marked increase in VKOR activity, which is sensitive to warfarin inhibition (3). Atleast two pseudo genes for VKORC1 have been identified on chromosome 1 and X along with several alternatively spliced transcripts encoding different isoforms. Recently a recombinant VKORC1 was purified from virally infected SF9 cells and VKOR activity was preserved in this highly purified fraction (4). The VKOR1 is associated with microsomal membrane preparation. VKORC1 is a 163 amino acid protein, the recombinant VKORC1 was purified as a 21kDa protein with tag protein from Sf9 cells. Oldenburg J, Bevans CG, Muller CR, et al. Vitamin K epoxide reductase complex subunit 1 (VKORC1): the key protein of the vitamin K cycle. Antioxid. Redox Signal. 2006; 8:347-53. 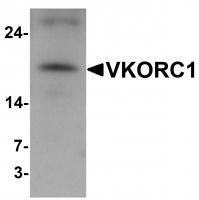 Western blot analysis of VKORC1 in A549 cell lysate with VKORC1 antibody at 1 ug/mL. 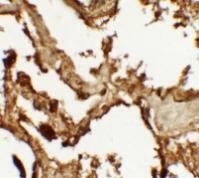 Immunohistochemistry of VKORC1 in human lung tissue with VKORC1 antibody at 2.5 ug/mL. 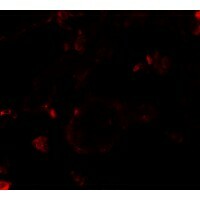 Immunofluorescence of VKORC1 in human lung tissue with VKORC1 antibody at 20 ug/mL.